"You were on time and ahead of expectations, very rare in the racing business." Ran my '76 Mustang ST2 at Road Atlanta on Mar 8-10. The RSG-prepped Tranzilla actually makes it look like I know what I am doing. In one heat I started 9th and passed the number 2 qualifier at the end of the first lap. Check out the Rockland stickers on the door. Thanks again for everything -- Chris. Check out this monster 1979 Ford F150 4x4 truck complete custom build with our unique Tranzilla Tremec 6-speed and our 4WD adapter install. Click here to see more. 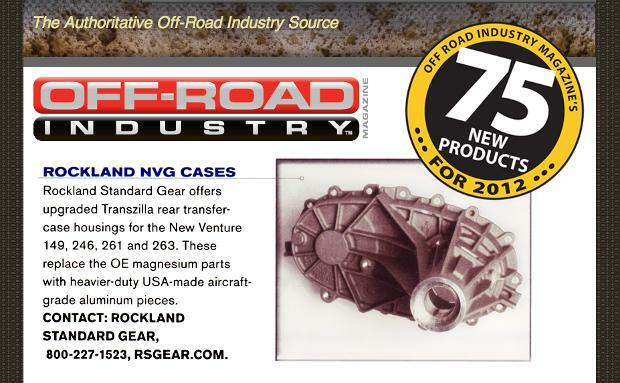 Off-Road Industry Magazine has selected our Tranzilla Replacement Half NVG Cases in their 75 New Products for 2012. Our USA-made, aircraft-grade aluminum replacement is what you've been looking for. Call us at 877-774-4327 to for more information and to order your part. While others merely talk, we deliver: "Jeff Cleary wanted a car that proved its performance on the race-track, instead of a dyno sheet. And with 600 hp at the rear wheels and elapsed times in the 10.70s on regular street tires, it's apparent he succeeded." Check out about how only our Tranzilla would do for this GMC Syclone modification, in this excellent article. The most abused components in a vehicle are the clutch and the manual transmission as these components are completely at the mercy of the driver. Most of this discussion will be tilted to performance vehicleS because they make up the vast majority of domestic cars that are still available with "stick transmissions". The same parameters of this discussion apply to foreign cars also, and of course the few pickup truck and SUVs that are still optioned with a manual transmission. The driver who chooses a manual transmission does so for more complete control of their driving experience. Since on the domestic side the only real volume of manually shifted vehicles you will see in your shop are Corvettes, Vipers, Challengers, Camaros, GTO's, Cadillac CTS-Vs, and Mustangs, some of which will be used in actual competition by weekend warriors and others will be tried out for enjoyment and for the impression of the female species. The road to ruin begins with the clutch. The primary issue with transmission damage is an improperly releasing clutch. A worn or slipping clutch causes a lack of torque transfer from the engine to the transmission, but does the transmission little or no harm. 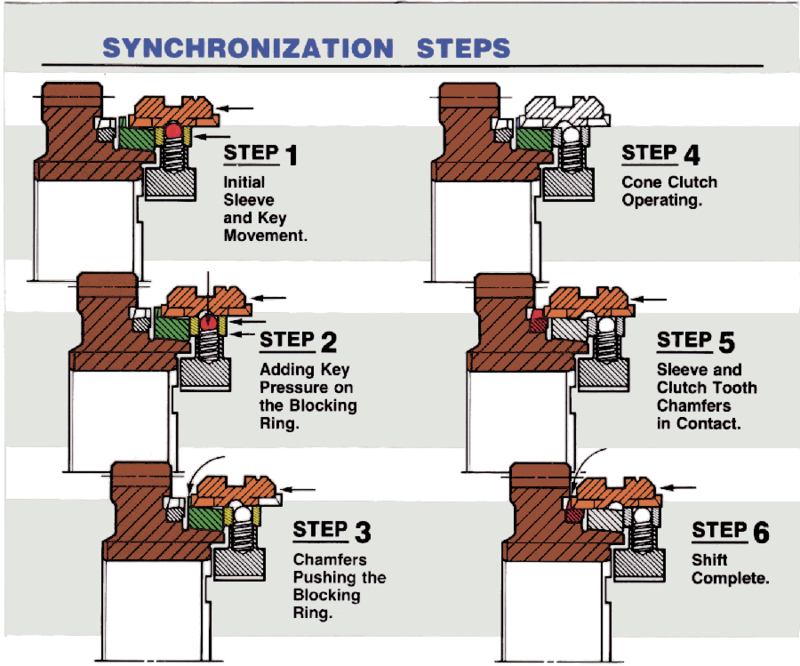 In order to have the synchronizers in the transmission function properly for smooth clash free shifts, the clutch must fully release when depressed, disconnecting the motor from the transmission completely and cleanly. The amount of pedal travel (2-4 inches on average) will result in an air gap at the disc of about 50/1000ths of an inch. The motor is not transferring torque into the transmission, and the output shaft of the trans is now being driven by the drive wheels. If there is no disconnect between the engine and transmission due to an improperly adjusted clutch travel, the synchronizers are now fighting the engine torque load. This causes grinding notchy shifts which will destroy the synchronizer or blocker rings, the engagement teeth on the speed gears and synchro sliding sleeves, the synchronizer keys, shift fork pads and the forks themselves. Whenever you see the steel keys broken or sheared off, there can only be several causes. The first is improper or no clutch release, driver error where the clutch is not released or trying to shift without using the clutch or a driver that is moving the shift lever before the clutch has released, rushing the shift. 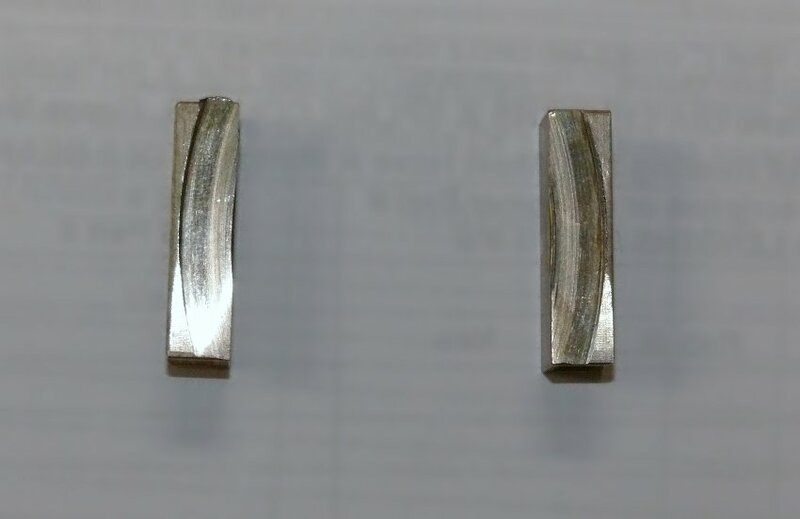 A common attempt at curing this problem is frequently to use billet solid keys because the common error is to put the fault on the factory keys. If the clutch release issue is not resolved, the billet keys may be tough enough to survive their environment, but the synchro rings will crack, or the key slots will distort, the synchro hub may crack, or a shift fork will break. None of this is the fault of the key, but either the driver's bad habits or the synchronizer trying to overcome all the torque load transmitted at the crankshaft. Tremec, ZF, and many other manufacturers have gone away from using keys in the synchronizers, replacing them with spring loaded balls and struts. These components will handle more abuse without breaking, but in the end the synchronizers and speed gears will die of torque induced fatigue. Another point of early transmission failure is the wrong choice of clutch for the application. This usually begins with the idea that installing a performance clutch will improve the vehicle performance. There are a great variety of clutch sets available on the performance side and many car owners do not understand what they were designed for when making a purchase. The correct setup will definitely improve performance over stock, and the wrong clutch will make driving a misery and create big time trans failure. We see all the time that an owner has opted to install a full racing clutch in a street driven vehicle. In many cases the friction material is way too aggressive for use in traffic , which shock loads the gear train causing broken inputs, clusters and speed gears, as well as possible damage to the differential and drive shaft. It is very important to match the clutch to the vehicle usage. A car that is only track driven can handle more aggressive setups, while a car that is a daily driver with occasional trips to the drag strip will be no fun to drive in traffic with a clutch that acts like an on/off switch. This happens very frequently in light trucks, where somebody's cousin tells him that the way to go is a ceramic button type of disc instead of the factory woven friction material. They both will work, but the aggressive grab of the button clutch puts the trans at risk as well as making his girlfriend puke sick. Again if the clutch is not releasing properly, the button type or dual disc clutches will increase the failures dramatically. One other issue that results in very rapid transmission damage similar to overly aggressive clutch friction material is the choice of the clutch disc itself. The vehicle was manufactured with a clutch disc that had a sprung hub. This allows the disc as it engages the flywheel and pressure plate to turn against the springs in the hub absorbing the shock load and removing harmonic vibrations that cause gear rattle and other noise issues due to engine harmonic vibrations. In the quest for better performance the owner may substitute a solid or unsprung clutch disc, eliminating the cushion effects engineered into the OEM product. An unsprung clutch hub should only be used in a purpose built race vehicle where the owner intends to freshen up the clutch and trans every race or two. The unsprung hub will definitely shorten the component life of the transmission. Another cause of transmission failure is lubrication. Everyone knows that lack of lube fill due to leaks or lack of maintenance is the kiss of death for any component, but the type and quality of lube is very misunderstood. Modern synchronizer rings are designed to be used with a specific lubricant which will be specified in the owner's manual. A synchro ring is a wet clutch, designed to grab the cone of the speed gear during a shift and speed it up or slow it down to match the input shaft speed to the output shaft. 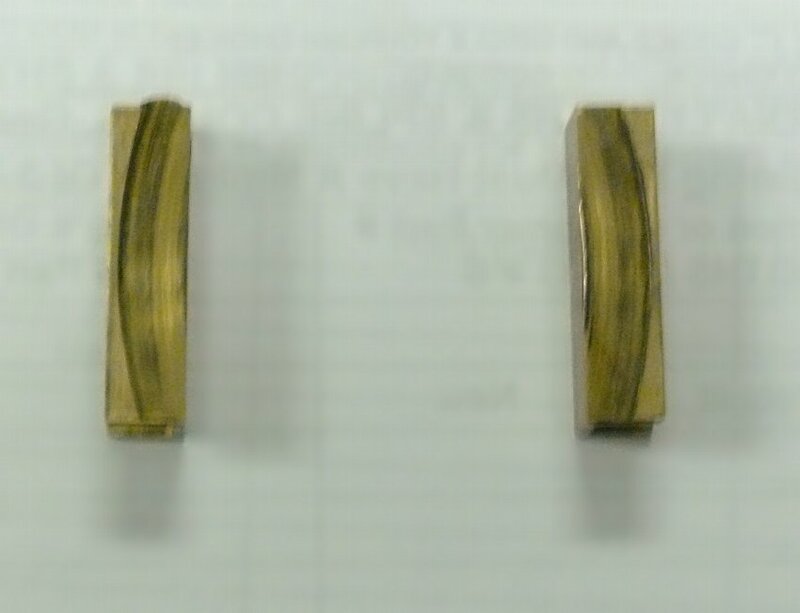 These rings are manufactured from many different compounds each of which has a different coefficient of friction. Brass and bronze rings have been replaced in many units by sintered metal or carbon fiber rings. There are no modern units left that will run on the old 75/90 weight gear oil. That oil is too thick to be exhausted from under the ring in the milliseconds it takes to make the shift, and since many of the new compounds are porous, if the wrong oil is used it will remain impregnated in the ring, and the ring will never function properly. Always be sure to use an oil that is specified for the model of trans in the vehicle. There are improved aftermarket oils but be careful as many contain compounds that carbon fiber rings in particular will not do well with. The amount of lubrication is also critical for shift timing. Overfilling a manual transmission will cause fluid to leave from the vent but will create windage problems. Windage is the effort needed for the gears to turn through the oil level. Dry sump race motors make more horsepower than a stock wet sump motor because the crankshaft is not fighting the oil in the bottom of the pan. Think of it as trying to run on a beach. It takes little effort to run on the hard packed sand near the tide line, but a great effort to run through 6 inches of water in the surf. When a manual trans is over filled and the driver makes a shift, the gear trains slows down very quickly when the clutch is depressed because of the fluid drag, altering the synchronizer timing and causing shift issues. A classic case of this was the Tremec 3650 series of 5 speed transmissions where the fill plug was actually designed too high in the case. On these units you cannot" fill to spill", but to ½ inch below the fill plug level for proper operation. An area that creates more transmission issues is the shifter. It is common to install a "short throw shifter" into a manual trans equipped vehicle. The shifter is designed to shorten the amount of movement in the stock shifter making the shifts happen quicker. There are many excellent short throw shifters on the market and they do improve the shift sequence. However the driver needs to understand that the time it takes to shift is predicated on how fast the synchronizer can complete the shift without gear clash. When you shorten the throw of the shifter it is possible for the driver to be moving the stick faster than the clutch can fully release, and before the synchronizer can complete the function of matching the input shaft speed to the output shaft speed. This results in grinding or blocked out shifts as the timing has been altered for the function of the components. Another issue we have seen over the years is the lack of vibration deadening construction on some aftermarket shifters. The auto manufacturers spend a fortune trying to isolate the interior of the car from all outside noise, vibration, and harshness (NVH). Some aftermarket shifters will create a "buzz" from the stick, or other noises not heard or felt with the factory stick. In any case a short throw shifter will complicate transmission failure due to a poor clutch release or out of time synchronization. The art of synchronization is poorly understood by most drivers. The synchronizer is like a zipper. Everyone knows how to use it, but few understand how it really works. 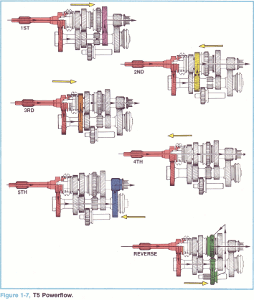 The basic understanding begins with the design of the manual transmission. We have an input shaft that is splined to the clutch disc and transfers torque (rotational force)from the engine crankshaft into the gear box. 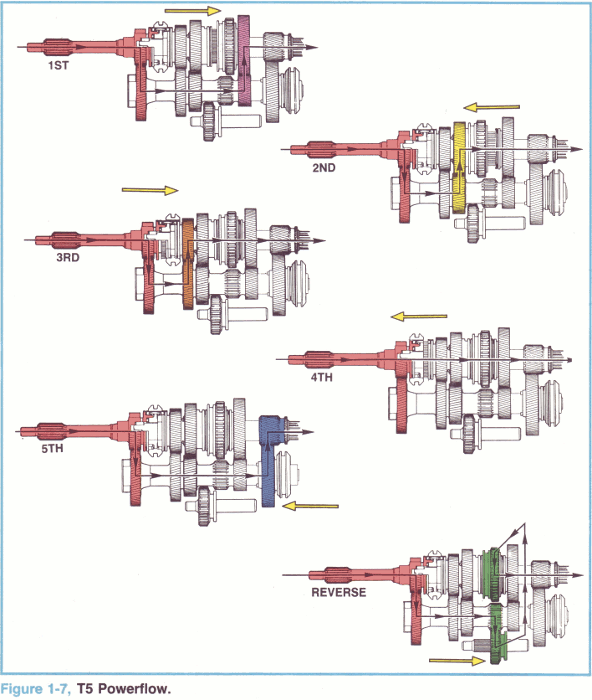 The input shaft is in line with and rides on the nose of the mainshaft (output shaft) of the transmission, but can turn independently from the mainshaft. The gear end of the input shaft meshes with a countershaft or cluster gear that is mounted parallel to the input and output shafts in the transmission case. This drives the cluster gear, which has multiple gears on it, that mesh with the speed gears mounted on the mainshaft. The speed gears are free- wheeling on the mainshaft. Then we have the synchronizer assemblies that are splined to the main shaft between the speed gears. All of the speed gears which include the input gear have a second set of teeth on them which engage the sliding sleeve on the synchronizer assembly. When a shift is made the shift fork slides onto the engagement teeth of the speed gear and that gear is now attached to the mainshaft and transmits power from the input through the cluster gear and back into the mainshaft driving the wheels of the vehicle. On a 6 speed transmission you will have a 1-2 synchronizer, a 3-4 synchronizer, a 5-6-reverse synchronizer. If the synchronizer sleeves are all centered the transmission is in neutral. 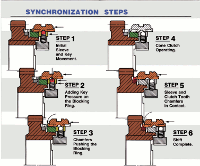 The synchronizer must have a way to engage the spinning gear without grinding. Between the synchronizer hub and the speed gear is the synchronizer ring (blocking ring) and a single or multiple set of cones that are attached to the speed gear. The synchro ring or rings turn with the synchronizer and are located in position by keys or struts that sit in the synchronizer body and move with the sliding sleeve. As the driver moves the shift lever to select a gear, the synchro keys force the synchro ring or rings onto the machined cone of the speed gear, slowing it down or speeding it up to match the speed of the output shaft which is being rotated by the drive shaft. With the clutch depressed, the input gear is now rotating at engine rpm, which is considerably slower than the output shaft if you have a proper clutch release. The synchro ring can rotate slightly within the sliding sleeve and the teeth do not line up with the engagement teeth on the speed gear. When the shaft speeds equalize, the ring will move in a circular motion enough for the sliding sleeve to completely engage the speed gear and complete the shift. This is why they are also called blocking rings as the block the sleeve from full engagement until the speed gear and shaft are at the same rpm, so the shift is completed without grinding. None of this will work unless the clutch can fully release and disconnect the torque from the crankshaft to the input. If you do not have that disconnect of the powerflow, you are now trying to stop or slow 400 plus foot lbs of torque in the motor with a small friction surface that may be 3 or 4 inches in diameter and ¼ to ½ inch wide. This immediately damages the friction material of the ring, and can shear of the synchronizer keys like a guillotine. Once that happens you will have blocked out or grinding shifts as the sliding sleeve clashes with the engagement teeth on the speed gear. Up shifts require a lot less synchronizer effort than down shifts. Drivers who wish to slow the gear box down by using the transmission find out that brakes are a lot cheaper than transmissions. Careful shifting, particularly on down shifts, prevent a shift from 5th to 1st which is really hard on the trans and engine. Rev limiters in modern cars prevent over revving the motor on up shifts, but cannot control engine speed on downshifts. We get many calls from people who have rebuilt their transmissions and now have bearing noise issues or notchy shifts. If you are rebuilding the gear box it is very important to thoroughly clean all of the components, including the synchronizer assemblies. Before taking the sliding sleeve off the synchronizer hub, match mark the hub and the slider so that it can be reassembled on the same splines. Metallic debris will accumulate between the slider and the hub and if you do not clean them completely, fresh lube will wash out the metal causing premature bearing failure. When there is a synchronizer failure, the shift fork pads will suffer. Many people opt to replace the plastic pads with brass or bronze pads as an upgrade. There is no reason to do this. The sliding sleeve is machined at the fork groove with a micro finish that is designed for plastic pads not metal. If the clutch is fully released there is very little load on the fork pads. Using metal pads as an upgrade is a waste of money, creates noises that were not there before, and will lead to premature pad wear. The fork and the detent system that keep it in place cannot hold the slider in position on the gear. The engagement teeth on the speed gear and slider have a back taper engineered into them to prevent the slider from hopping out of the gear under changing throttle positions. If the pointing of the engagement teeth have been rounded off due to a bad synchronizer ring the gear will be hard to shift into and should be replaced. If the back taper is worn out of the engagement teeth on the speed gear and slider you will get gear jump out. As you can see, most transmission failures begin outside the transmission with a poor clutch release or a sloppy driver. In vehicles equipped with automatic transmissions, the driver has very little control over the shifts, but the manual trans has to relay on the driver to shift properly and full release the clutch every time.